This article is about a type of food. For the spiritual concept, see Tapas (Sanskrit). For the Spanish film, see Tapas (film). For the type of cloth, see Tapa cloth. For the mobile app, see Tapastic. For other uses, see Tapa (disambiguation). A tapa (Spanish pronunciation: [ˈtapa]) is an appetizer or snack in Spanish cuisine and translates to small portion of any kind of Spanish cuisine. 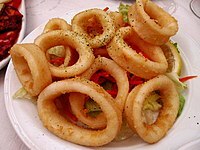 Tapa may be cold (such as mixed olives and cheese) or hot (such as chopitos, which are battered, fried baby squid). In some bars and restaurants in Spain and across the globe, tapas have evolved into a more sophisticated cuisine. Tapas can be combined to make a full meal. In some Central American countries, such snacks are known as bocas. In parts of Mexico, similar dishes are called botanas. The word "tapas" is derived from the Spanish verb tapar, "to cover", a cognate of the English top. In pre-19th century Spain tapas were served by posadas, albergues, or bodegas, offering meals and rooms for travellers. Since few innkeepers could write and few travellers read, inns offered their guests a sample of the dishes available, on a "tapa" (the word for pot cover in Spanish). According to The Joy of Cooking, the original tapas were thin slices of bread or meat which sherry drinkers in Andalusian taverns used to cover their glasses between sips. This was a practical measure meant to prevent fruit flies from hovering over the sweet sherry (see below for more explanations). The meat used to cover the sherry was normally ham or chorizo, which are both very salty and activate thirst. Because of this, bartenders and restaurant owners created a variety of snacks to serve with sherry, thus increasing their alcohol sales. The tapas eventually became as important as the sherry. Tapas have evolved through Spanish history by incorporating new ingredients and influences. Most of the Iberian Peninsula was invaded by the Romans, who introduced more extensive cultivation of the olive following their invasion of Spain in 212 B.C. and irrigation methods. The discovery of the New World brought the introduction of tomatoes, sweet and chili peppers, maize (corn), and potatoes, which were readily accepted and easily grown in Spain's microclimates. It has also been claimed that tapas originated in the south of Spain during the time of the Spanish Inquisition as a means of publicly identifying conversos, Jews who had converted to Christianity. Since tapas often consist in part of ham or other non-kosher foodstuffs, the reluctance of the conversos to eat whatever tapas dish was offered to them could be taken as a tacit admission that they had not abandoned their Jewish faith, thus tapas were a tool of the Spanish Inquisition. There are many tapas competitions throughout Spain, but there is only one National Tapas competition, which is celebrated every year in November. Since 2008, the City of Valladolid and the International School of Culinary Arts have celebrated the International Tapas Competition for Culinary Schools. Various schools from around the world come to Spain annually to compete for the best tapa concept. It is also commonly said[by whom?] that since one would be standing while eating a tapa in traditional Spanish bars, they would need to place their plates on top of their drinks to eat, making it a top. Some[who?] believe the name originated sometime around the 16th century when tavern owners from Castile-La Mancha found out that the strong taste and smell of mature cheese could help disguise that of bad wine, thus "covering" it, and started offering free cheese when serving cheap wine. A final possibility[according to whom?] surrounds Felipe III, who passed a law in an effort to curb rowdy drunken behavior, particularly among soldiers and sailors. The law stated that when one purchased a drink, the bartender was to place over the mouth of the mug or goblet a cover or lid containing some small quantity of food as part of the purchase of the beverage, the hope being that the food would slow the effects of the alcohol, and fill the stomach to prevent overimbibing. It is very common for a bar or a small local restaurant to have eight to 12 different kinds of tapas in warming trays with glass partitions covering the food. They are often very strongly flavored with garlic, chilies or paprika, cumin, salt, pepper, saffron and sometimes in plentiful amounts of olive oil. Often, one or more of the choices is seafood (mariscos), often including anchovies, sardines or mackerel in olive oil, squid or others in a tomato-based sauce, sometimes with the addition of red or green peppers or other seasonings. It is rare to see a tapas selection not include one or more types of olives, such as Manzanilla or Arbequina olives. One or more types of bread are usually available to eat with any of the sauce-based tapas. In Andalusia and certain places in Madrid, Castilla-La Mancha, Castile and León, Asturias, and Extremadura, when one goes to a bar and orders a drink, often a tapa will be served with it free. As a drink, it is usual to ask for a caña (small beer), a chato (glass of wine) or a mosto (grape juice). In several cities, entire zones are dedicated to tapas bars, each one serving its own unique dish. In León, one can find the Barrio Húmedo, in Logroño Calle Laurel and in Burgos Calle de la Sombrerería and Calle de San Lorenzo. Banderillas, or pinchos de encurtidos, are cold tapas made from small food items pickled in vinegar and skewered together. They are also known as gildas or piparras and can consist of olives, baby onions, baby cucumbers, or chiles (guindilla) with pieces of pepper and other vegetables, and sometimes an anchovy. Chorizo al vino (or Chorizo a la Riojana): chorizo sausage slowly cooked in red (rioja) wine. Chorizo a la sidra: chorizo sausage slowly cooked in cider. Often garlic is also added. La Bomba: Beef, a hearty beef meatball, encased in a sphere of mashed potato, covered in breadcrumbs and deep fried. Raxo: pork seasoned with garlic and parsley, with added paprika, called zorza or jijas in Palencia. Huevos rotos: A dish consisting of fried eggs with the yolk broken after cooking. The term tapas narrowly refers to a type of Spanish cuisine. More broadly, a similar format of dining is referred to as “small plates”. Such dishes are traditionally common in many parts of the world, and have become increasingly popular in the English-speaking world since about 2000, particularly under the influence of Spanish tapas. In Mexico, there are not many tapas bars. However, the "cantinas botaneras" come close to the Mexican version of a tapas bar, but they operate on a very different business model. The appetizers ("botanas") keep coming as long as the patron keeps ordering beer, liquor or mixed drinks. The more the patron drinks, the more he or she eats. These establishments, some over a hundred years old, such as La Opera, are particularly popular around the Centro Histórico in Mexico City, but there are similar cantinas farther out in other regions of the city (as in Coyoacán) and its metropolitan area, or even in other cities like Guadalajara, Jalisco and Xalapa, Veracruz. Picada is a type of tapas eaten in Argentina and Uruguay, usually involving only cold dishes, such as olives, ham, salami, mortadella, bologna, different types of cheese, marinated eggplants and red pimentos, sardines, nuts, corn puffs, fried wheat flour sticks, potato chips, and sliced baguette. It may also include hot dishes such as french fries, pizza or milanesa. In Korea, drinking establishments often serve anju (안주) of various types, including meat, seafood, and vegetables. In Japan, izakaya are drinking establishments that serve accompaniments similar to tapas. In Philippines, pulutan is the tapas-style food served to accompany liquor or beer. ^ "Tapas, the Little Dishes of Spain | Living Language". www.livinglanguage.com. Retrieved 2018-05-02. ^ "The history of the Spanish tapas". The Telegraph. 2016-07-01. ISSN 0307-1235. Retrieved 2018-05-02. ^ Casas, P. (1985). Introduction. In Tapas, the little dishes of Spain (xv) [Introduction]. New York: Alfred A. Knopf. ^ "History of Olive and Olive Oil - Spanish-food.org". 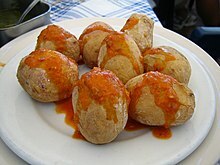 www.spanish-food.org. ^ Sebag Montefiore, Simon. "Blood and Gold: The Making of Spain with Simon Sebag Montefiore". BBC iPlayer. Retrieved 15 October 2018. ^ "concursonacionaldetapas.com - This website is for sale! - concursonacionaldetapas Resources and Information". www.concursonacionaldetapas.com. Archived from the original on 2018-08-05. Retrieved 2019-01-02. ^ "Estás accediendo a una IP compartida por varios hostings". www.internationalschoolofculinaryarts.com. ^ "International Tapas Competition for Culinary Schools". Archived from the original on 2012-07-31. Retrieved 2012-08-09. ^ "The World of Tapas in Spain". ^ User, Super. "El origen de las Tapas y Alfonso XIII". ^ "Gildas (Anchovy, olive and guindilla skwewers)". ^ New York Food Journal. "Setas al Ajillo Recipe". Wikimedia Commons has media related to Tapas. Look up tapas in Wiktionary, the free dictionary.